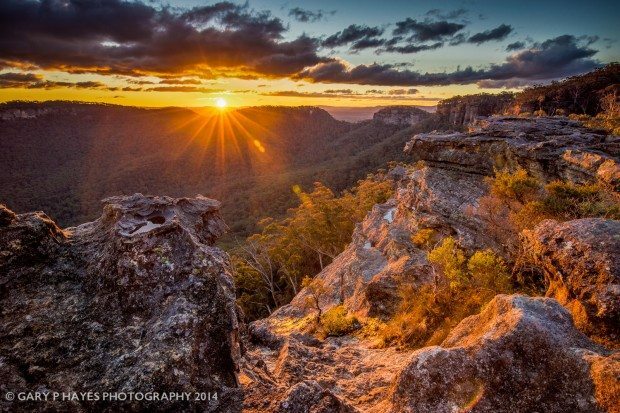 ABOUT: One of the most visited lookouts on the western escarpment of Mount Victoria. A variety of rocky outcrops give a lot of variation looking down onto a cul de sac of the Kanimbla Valley and Victoria Pass on the right. It provides a great foreground when the sky is interesting throughout the day, but best in Golden hours. There are a few spots apart from the first rock platforms, a couple lower down and below the main rocks is a nice ledge and overhang. PHOTO EQUIPMENT TO BRING: A tripod and ultra to wide angle lenses area ideal plus a moderate graduated neutral density for the sky. GETTING TO THE SPOT/S: Park on the open ground where Beaufort Av meets Grand View (there are no easy spots to park at the end of Beaufort). Walk down to end of Beaufort and take the obvious walking path to the left when you meet a private house gate. The rocks are only 2 minutes further on down a dirt trail followed by a short rocky bend.